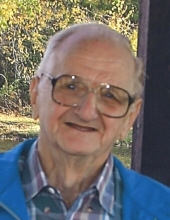 Robert Kuper, 95, of Terre Haute, passed away Thursday morning, April 11, 2019 at Harrison’s Crossing Health Campus. Robert was born October 2, 1923 in Terre Haute, Indiana to Alvis and Laura Kuper (Luebbenhusen). Robert graduated from Gerstmeyer High School in 1941 and served in the Unites States Army during WWII where he served in Germany and met his loving wife of 70 years, Hildegard Weilbach Kuper. Hildegard preceded him in death in 2017. Robert worked at the Terre Haute Brewery, Ethyl Visqueen and Indiana State/Old National Bank. Survivors include his two sons, Robert E. Kuper of Crestwood, KY and Thomas L. Kuper (Freda) of Terre Haute; three grandchildren, Angie Miller (Chad) of Panama City, FL, Thomas M. Kuper (Jessie Jansen) of Terre Haute and Adam J. Kuper (Shelby) of Paris, IL. Also surviving are four great-grandchildren, Bryce Miller (Jessica), Logan Miller (Shawnna), Aiden Kuper, and Alivia Kuper; and one great-great grandchild, Landon Miller. Robert was a member of St. Benedict Catholic Church. He loved working around the house and helping others. His family would like to extend their sincerest appreciation to Dr. V Reddy and Millie Kooistra NP, the wonderful, caring staff at Harrison’s Crossing Health Campus, and SouthernCare Hospice Services. Private services will be conducted in Callahan & Hughes Funeral Home, 605 South 25th Street, with Father Fred Pasche, OFM Conv. officiating. Private burial will be in Calvary Cemetery. A celebration of life will be planned for a later date. Memorial contributions may be made to the charity of your choice. Funeral information may also be found at www.callahanandhughes.com. To send flowers or a remembrance gift to the family of Robert J. Kuper, please visit our Tribute Store. "Email Address" would like to share the life celebration of Robert J. Kuper. Click on the "link" to go to share a favorite memory or leave a condolence message for the family.